This is Tartt’s Vermont winter garden where characters are carefully developed and tended. In the early chapters the chaos of college grows like grass in the distance, not in the forefront (later that chaos will manifest like tall gnarly weeds). Are they outcasts or intellectual saints? Classic scholars or pretenders? Cold-blooded killers or repentant bunglers? It’s a mix, from the obnoxious Bunny to the placid and caring Henry to the wholesome twins, and so forth. Richard himself seems the one most like a fish out of water. The plot unfolds slowly, as Tartt takes us on excursions into the countryside and into bleak halls of hardwood floors, tables laden with whisky, unpatched roofs that allow snow, and grandiose old houses gone bohemian. The mental excursions are ours via Richard. Trepidation, doubt, mistrust, admiration, and in the case of the girl in the group an unfulfilled adoration. Some screwy happenings take place. A conspiracy is likely, and Richard is riding the fence in a dangerous position. While the story unravels artfully, Tartt (who was in college when she wrote this) makes a few missteps with contrived plot events, just a couple that seem too coincidental and mechanical. Hard to find flaw, however. There is immense talent in the writing. Some chapters – like the one in which Richard spends semester break alone – are densely atmospheric and make for compelling reading. Things slow down as Tartt describes each person in the group’s psychologically detailed experiences with the bad side of Bunny Corcoran. Then, toward the end of Part 1 and into Part 2, the story accelerates again and pulls us back in. There is little relenting (other than maybe an overly long stay at the Corcorans before the funeral) all the way to the end. A terrific book, a novelist’s extravaganza of technique and talent, in story movement and especially in characterization. 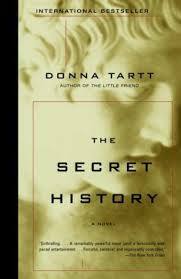 Posted in booknotes and tagged Donna Tartt review Secret History on June 12, 2014 by Wm P.